Tim Burton Confirms Dark Shadows. 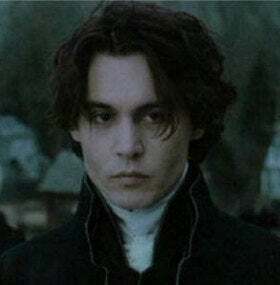 Vampire Johnny Depp? Tim Burton has confirmed that his next project will be remaking ABC's vampire soap Dark Shadows, whose rights are rumored to belong to Johnny Depp. This could mean we'll finally see our Johnny Depp vampire dreams come true. At the Alice In Wonderland press conference, people cornered Burton about his next rumored movie project Dark Shadows, the vampire soap opera that aired on ABC. Yeah if I ever finish this one here [Alice in Wonderland]. It's hard to think beyond this at the minute but yeah that's the plan. The rights to the show's rights were optioned by Infinitum-Nihil, which is Johnny Depp's production company. This can only mean one thing: Edward has some gigantic competition. Burton and Depp do everything together lately, there's no reason we shouldn't start assuming the same. Depp as a vampire — is there anything more ridiculous and wonderful at the same time?